We received this photo of an adder enjoying the sunshine yesterday, on the moor side of the lake at Lockwood Beck. Adders hibernate from October, emerging in the first warm days of March, which is the easiest time of year to find them basking on a log or under a warm rock. The adder is the UK’s only venomous snake, but its poison is generally of little danger to humans. 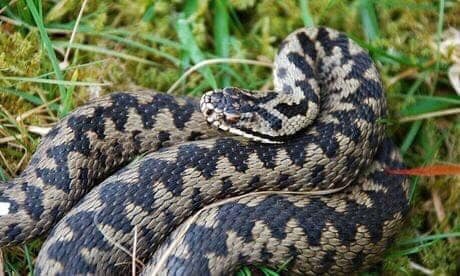 An adder bite can be very painful and cause a nasty inflammation, but is really only dangerous to the very young, ill or old, if you do happen to get bitten, medical attention should be sought immediately. Adders are secretive animals and prefer to slither off into the undergrowth than confront and bite humans and domestic animals with the majority of attacks happening if they are trodden on or picked up.